More than $45,000 separates the bottom-ranking district from the top. Next has heard from many teachers following our report on the average teacher salary in Colorado. 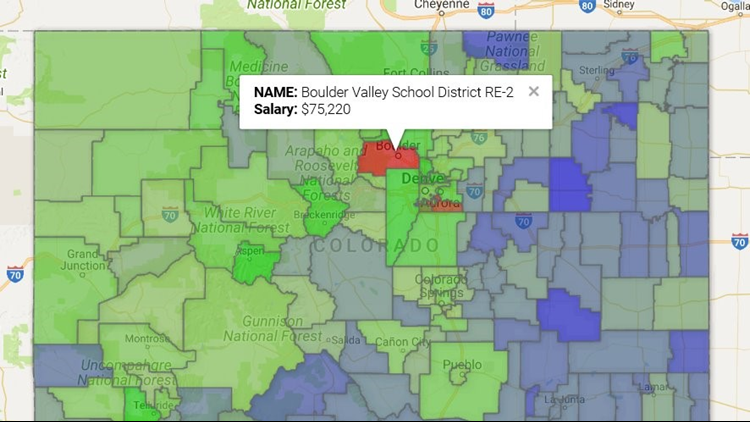 We have put together an interactive map of the average teacher salary in every district, based on information from the Colorado Department of Education. You'll notice that Woodlin School District, in Woodrow, comes in last at $29,356. Boulder Valley School District (in red) comes in at No. 1 with an average of $75,220. Click on the different districts in the map to see the average salary listed there.